Mizuna greens (which translates to water greens in Japanese, 水菜) are mustard family plants native to the Kansai region of Japan. 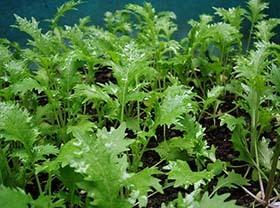 Their frilly, edged, glossy, deep green leaves have been the favorite of chefs in the mesclun or Spring Mix salads. Botanical name: Brassica juncea var. japonica. This cool season annual plant is also popular as Japanese mustard (kyona), grows in clusters of long, pencil-thin, white stalks spreading into a dark-green, crispy, deeply serrated leaves as in chervil. Nearly about two dozen different hybrid cultivars of mizuna greens developed as seasonal crops in Japan. It is a fast growing herb which prefers well-drained, sandy, and moist soil to flourish. Seedling generally done during late summer or fall. The crop usually takes about 40-50 days to grow, and suitable for harvesting at any stage; from micro-greens to mature plants. Fresh shoots grow-again from the harvested ends. If left alone till the late spring when temperatures rise, the plant bolts, give rise to small clusters of yellow blossoms. Mizuna has become very popular as a salad green as well as in delicious cooked dishes. Being a cruciferous (Brassica) vegetable, mizuna incorporates all the antioxidant qualities of fellow mustard family members like mustard greens, napa cabbage, bok choy, etc. Its leaves carry very low calories, about 23 calories/100 grams or 39 calories per 170 grams/stock (bundle). Nonetheless, its dark-green leaves hold ample amounts of phytonutrients, vitamins, and minerals. Additionally, its stalks contain a very good amount of dietary fiber that helps control cholesterol level by interfering with its absorption in the gut. Adequate fiber in the food aids in smooth bowel movements, and thereby offers protection from hemorrhoids, constipation as well as colon cancer diseases. It is an excellent sources of vitamin-K. 170 g of fresh leaves carry about 204 μg of vitamin K-1 (phylloquinone). Vitamin-K plays a potential role in the bone mass building function by promoting osteoblastic activity in the bone. It also has an established role in Alzheimer's disease patients by limiting neuronal damage in their brain. Being a member of Brassica vegetables, it is a rich source of antioxidant glucosinolates. Other compounds found in it are flavonoids, indoles, sulforaphane, carotenes, lutein, and zeaxanthin. Indoles, mainly Di-indolyl-methane (DIM) and sulforaphane have proven benefits against prostate, breast, colon and ovarian cancers by virtue of their cancer-cell growth inhibition, cytotoxic effects on cancer cells. Fresh leaves are also a modest source of the B-complex group of vitamins such as folic acid, pyridoxine, thiamin, riboflavin, etc. Folates are water-soluble vitamins which have a significant role in the DNA synthesis, and cell division. When given to women during their peri-conception time, folic acid can help prevent neural tube defects in the newborn babies. Fresh mizuna leaves are an excellent sources of vitamin-C. 170 grams of fresh leaves provide 93.5 μg. Vitamin-C (ascorbic acid) is a powerful natural antioxidant that offers protection against free radical injury and flu-like viral infections. Mizuna leaves are also incredible sources of vitamin-A (provide 189 μg). Vitamin-A is an essential nutrient required for maintaining healthy mucosa and skin. Consumption of natural fruits rich in flavonoids helps protect from lung and oral cavity cancers. Fresh greens are an excellent source of several essential minerals such as molybdenum, calcium, iron, magnesium, manganese, potassium, zinc, and selenium. Fresh mizuna greens can be easily found in the supermarkets year around. In Japan, the greens and blossoms can be a common scene in farmer markets during the spring season. You can figure out light color stalks with deeply lobed, frilly, jagged edged brilliant green leaves from a close look. Buy fresh greens packed in bunches or wrapped in a plastic cover, kept nearby other common greens like bok choy, spinach, kale, turnip greens, etc. Avoid wilted, yellow, disclored leaves. Fresh mizuna leaves, flower buds, and stems can be used in a variety of cuisine all over Japan, South Korea, Taiwan, and China. Mizuna greens usage rapidly increasing in the USA and Europe, thanks to the advent of better transportaion and storage technologies. Wash its leaves thoroughly in clean running water to remove any sand and soil. Trim away thick mid-ribs and stems. 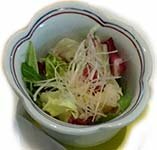 Many traditional Japanese cooking styles use fresh mizuna greens. The greens goes well with yosenabe, sukiyaki, ohitashi, hariharinabe, etc, served in the nabemono (Japanese hot pot) style. Fresh, tender mizuna greens are a common itens featuring in the mesclun or spring-mix along with lettuce, endive, chervil, and arugula. This green also used in soups. Braised/stir-fried, it mixes well with ham, pork, and bacon. High phytate and dietary fiber content in the mizuna greens may interfere with the bioavailability of minerals like iron, calcium, and magnesium. Because of its high vitamin-K content, patients taking anti-coagulants such as warfarin are encouraged to avoid this food since it increases the vitamin-K concentration in the blood, which is what the drugs are often attempting to lower. This may advertently raise the effective dose of the drug. Being a mustard family plants, mizuna contains oxalic acid, a naturally-occurring substance found in some vegetables, which may crystallize as oxalate stones in the urinary tract in some people. It is, therefore, people with known oxalate urinary tract stones are encouraged to avoid eating vegetables belonging to Brassica family. <<-Read Chicory greens Nutrition facts and Health benefits. <<-Back to Vegetables from Mizuna Greens. Visit here for an impressive list of vegetables with complete illustrations of their nutrition facts and health benefits.